A piece of rather long-form journalism coming up below. This is not so much a restaurant review as a review of a restaurant concept. Bolivia doesn’t disappoint Western eyes set upon it for the first time. On my first visit in 2007, walking across the border with Argentina at dusty La Quiaca onto dustier Villazon on the Bolivian side, I was agog as four-foot tall octogenarian women, teal-stained and creased of face and bent almost 90 degree over, race-walked past me with several bags of cement slung over their backs. In my brain, two synapses met and made love: one, all the clichés I’d boiled up about what I expected Latin Americans (never mind Andeans, never mind Bolivians) to look like, gathered from travel guide books and Flickr photo galleries, and two, the bit where you learn something brand new that only The Road can teach you. That mixture of the expected with the unexpected is what well-heeled gap year students come to find in a place like Bolivia – that, and the cocaine. But what do well-heeled visitors, expats and gringo inhabitants of the country want of the place? In my opinion, not what Gustu has to offer – well, not yet, anyway. 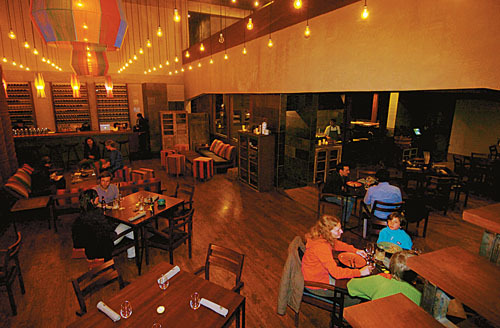 Gustu is one of several high-end restaurants across the Andean countries that has opened to cater to the region’s emergent middle classes, who mingle with said expats and gringos. They all have the means to enjoy the extraordinary ‘authentic’ culinary riches of the region, but packaged up in a thoroughly chic, modern and sanitary (read, ‘safe’) environment. Un poquito de Londres en los Andes, or un peu de Paris perhaps, or Copenhagen, where founder Klaus Meyer is from. Gustu is all about gastronomy; not just food, but the experience around it, is the vision. And as the founder of Noma, voted best restaurant in the world in 2010 and 2011, Meyer knows how to give monied punters what they want. Noma’s thing is the wrapping up of Nordic cuisine, produce and culture in a world-class, two Michelin star environment. Forbes magazine describes it as a place where at least one dish in every meal “makes you glad to be alive”, which helps when you leave a couple hundred quid poorer. Gustu is a repeat of this idea, but in very different cultural circumstances. It’s somewhat the grown-up version of the Andes’ hostel trail, where foreign gap year kids congregate with their equal numbers from other rich nations, llama jumper-breasted, to enjoy the infamous marching powder among the reassuring safety of their peers. I take no issue with those scenesters: they’ll be stacking shelves and selling hedge funds soon enough, so let them blow off steam and try old wine in new bottles. But Gustu is a jarring upgrade on the concept of something new in familiar surroundings, with its waitresses in thigh-grazing, black corduroy pollera and matching black shirts. It is too little of Bolivia inside an Ikea pastiche of a European dining experience. It neither satisfies the genuinely curious visitor with sufficient local ‘authenticity’ nor delivers enough first-worldliness to draw La Paz’ nouveau riche week after week. It just isn’t much fun to be with, or to look at – and I visited twice, just to be sure. It’s unusual for a restaurant reviewer to tackle décor before food, which will be mentioned last here, but that’s what you consume first in any restaurant, and the first cut is the deepest. To return to my maiden voyage over the border, I had my mind (enjoyably) bent by the sight of all Bolivia’s authentic madness, the elderly women, their bright pollera with their bowler hats, the frontier wilderness mixed in with breathless mercantilism. You’re a long way from it here. For a start, Gustu is a million miles (and two hours of tailbacked traffic) across town and away from the bulk of La Paz civilisation, in the white, wealthy quarter of Calacoto. Here, men in army fatigues guard romantically-lit private streets from sentry boxes. Once arrived, yes, Gustu beckons you into Copenhagen with its understated entrance. But on stepping in, it’s dead quiet. No music plays. It’s a bit cold, and the aircraft-hanger like walls are painted a flat clay grey. There are no photos, paintings, sculptures, no pieces of Andean art, nothing to get your mind into gear for a new and exciting experience costing more than most natives’ monthly wage. Compare that with Noma’s interiors – yes, grey, but a lighter, warmer, tonal grey – with furs draped over easy chairs, rustic brick walls and aged wooden beams. Something to feel, to look at, to be inside of. Not so much at Gustu. A couple of small couches at the entrance next to the bar are made up in what is presumably Gustu’s take on ‘Andean’ fabrics: stripey, colourful and rough. The same fabric hangs down from the high ceiling in the form of long lampshades. Colour, yes, but not Andean or Bolivian colour. I’ve come for dinner in some sort of clown prison. Take a trip to the ethnographic museum in the centre of the city to discover the breadth, intricate beauty and meanings of regional textiles. They aren’t just there to be pretty for us foreigners. Patterns vary by region, tribe, age, family, ayllu, trade, ritual, time of year – but they all say something, flora, fauna and human life in the Andean cosmovision, in ambers, maroons, shocking pink, neon green, and earthy brown. Stripey yellow and red is no kind of Bolivia I’ve known, and sits badly with the deadening attempt to Europify with empty grey walls. What is perplexing about this is that Gustu’s interiors were overseen by a Pacena fashion and homewares designer, Joyce Martin. I wonder what the brief was. I search the faces of other diners to check the clientele: of maybe 15 tables, only about four are taken, on both visits. The one within earshot is a trio of American journalists having the food explained to them by Jonas, the blonde, Danish restaurant manager and sommelier. Behind me stuck in a corner is a young, monied-looking couple with a small baby, looking rather miserable. A couple of yanqui tourists sit way over the other end of the place, and then there’s myself and my two friends, a photographer and a music teacher, both from La Paz. Before our starters come the bread rolls. Part of Gustu’s business plan, Jonas tells me, is to open a bakery in the city; he tells me that Bolivian bread is awful. The rolls are fine, nothing like the ones I’d been eating for breakfast at my friend’s house near El Alto – but no better. The butter was served on a little slate with a silver butter knife: Paris was interrupting rudely, as Parisians do, and I felt positively dainty manhandling it onto my roll. Is this the cosmopolitanism that local visitors want of this place, I asked myself, and if so, do they know if this is what Europe feels like? I found myself bristling again looking at the small grey knotted serviette in which the bread arrived, undone by the waitress on the table as if setting down Huckleberry Finn’s worldly belongings. I looked through the printed menu for the explanation of this ritual, and glanced at the walls for gringo helping signs, but the waitress made no attempt to translate. I didn’t understand. I asked my friends what this was all about. 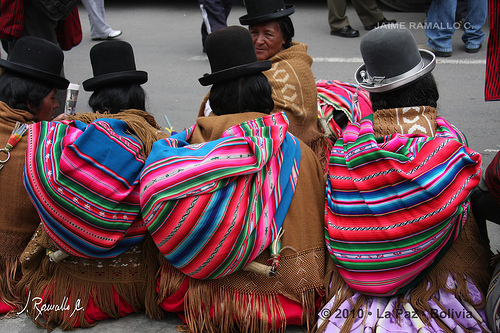 They suggested that it was supposed to emulate the aguayo, the large square of hand-woven fabric used by Andean peoples to carry foodstuffs to and from the market – these are trading and agricultural peoples – to carry wawas (babies) on backs up and down mountain passes or on city buses, and to serve food or coca leaf in a traditional apthapi ritual, something I was lucky enough to attend myself on my trip this year. I could see this was an attempt to incorporate something very Bolivian into the Gustu experience, but why not use the Andean textiles aguayos are made with, instead of a boring grey cotton napkin? Make the breaking of bread a Bolivian statement in the colours that travellers will see on the streets. Wawas continue to be carried in aguayos, and stallholders continue to trade their wares on them. Why hasn’t Meyer brought his clueless foreign diners into his vision with a simple explanation of that history and meaning, without so much as a paragraph on the menu? I mentioned that I visited Gustu twice. My first visit was aborted after my two-hour trip there because my friend, a Bolivian who lives in Germany, didn’t turn up. But Jonas calmed me down with a cocktail of Singani, orange and thyme. Singani is the national eau-de-vie, a brandy-like spirit distilled from Muscatel grapes, served warm up in the colder reaches. It’s not a drink I like, but clothed in citrus and finished with a sharp little Sunday roast herb edge, it was a pleasingly innovative turn on a Bolivian tradition. Other visitors might not know what Singani is; and perhaps they’d enjoy their visit more if they were told. Jonas has written about his plans to get big wine producers to mentor Bolivia’s winery minnows and capture this new world. I think he could really make it happen for Bolivian wine. I can only hope that with this, he tells the story he finds to Gustu’s guests. Onto the food. My costillar de lechon, pork cooked gently in milk and butter served with onions and pears, was good. There wasn’t much of it for 115 Bolivianos, but that’s haute cuisine for you. My friends had the llama with chuno, the former of which is out of many locals’ price range these days, but the latter – a grey, freeze-dried potato – a dietary staple for the masses. I liked Jane Black’s review of Gustu in Food & Wine that reveals Meyer’s first llama meat delivery showed up wrapped in a blanket (possibly an aguayo?) in the back of a taxi. Now that is authentic! It brings back memories of taking lanches (a bastardised version of the word ‘lunch’ I have seen in Bolivia and Brazil) in the central market of Potosi, the historic silver mining city where for the first time, I clapped eyes on meat butchery Bolivian style. A very portly lady presided over an ancient, flaky wooden beam, over which huge sides of cow flapped in the breeze just a few steps from where myself and two travelling friends were wolfing down bowls of steaming sopita. It wouldn’t pass an official inspection back home. But it’s how many Bolivians really live. Not much of human life is here at Gustu yet. The lack of ambience and community in Gustu jabbed me in the back throughout dinner and left the biggest impression. Jonas explained that he just didn’t know why it was so quiet, that this was really unusual. I went on a Wednesday and a Friday night, and both were the same. Fair enough, restaurants need some time to get the word out and punters in. But I think Gustu will continue to struggle attracting first and repeat customers beyond the first flush of glowing publicity it has enjoyed. Meyer has himself spoken about the difficulty Gustu has persuading Bolivians to visit, indicating a fundamental problem with his vision here. For what it’s worth, my dining partners said they would come again, but maybe for a special occasion – though our bill came to 750 Bolivianos, a little more than the average monthly household income (in a country where not too many people are in regular salaried employment). And other local friends were not keen on trying it at all. Sure, maybe some wealthy locals will enjoy the prisonesque walls if they think that’s the height of Western opulence. There is strong demand in Bolivia for foreign things. The same food presented in a regular food stand or cafe would cost around 20-30 Bolivianos, and many people’s mum’s make delicious, fresh specialties for the daily family meal that rival Gustu’s. So there is a gap for Meyer to bridge with the locals. Bolivians know their food is good; they love to eat. A first-time gringo diner may be unaware of the sheer variety of foods that are unique to the Bolivian topography and climate systems: jumbo pods that contain not peas but something akin to candyfloss, potatoes that are brown on the outside but shocking pink on the inside. Apparently, Gustu is compiling a registration of all the weird and wonderful foodstuffs his team come across. Its team is gathering a lot of information about the biodiversity, cultures, histories, cultivation and uses of Bolivian produce. But none of that is made available to diners, despite the time and money the Melting Pot foundation puts into training its young charges on all of this. Before one tastes the ceibo flower, one sees it on the plate, and has the chance to marvel at just how far from home they are. So why not provide some details, some photographs for the punters – in the menu, on the walls, through the waiters’ descriptions? There’s no excuse for the lack of atmosphere. La Paz is a city of intellectuals, of artists, of dreamers, and Bolivia’s population is young. They stand at a unique crossroads in Bolivian history, inculcated with all the regional stories, cultures, beliefs, traditions and habits of this complex country, but with both feet firmly in the 21st century, with its J-Pop, network games, smartphones, women engineers and worldly ambitions. Its many creatives strive against a lack of funds and materials to produce work in all media rivalling the quality anywhere, and reflecting their own take on what it means to be Bolivian. Any number of those creatives would surely throttle a chance to hang their work on these very large walls, to be seen, to be heard. But they are shut out here. My dining partners both play cello in the city’s youth orchestra. One of them is also a member of the iconic Wara rock-classical orchestra, pride of the city. But they play for free, smuggle knock-off Chinese-made cellos in on overnight buses, study from books of photocopied text, and they’ve never had access to string wax nor horsehair to replace their bows. Still, they sound incredible and they would not be out of place at the Royal Festival Hall. Why can’t some of their players be drafted in to play intimate, low-key sets in one of the very draughty corners of Gustu, to welcome in diners with the sound of cosmopolitan Bolivia set against the most earthy of Bolivia’s riches – its food? Why is Gustu’s take on Western chic so deadening to the senses when an intensity of home-grown expression sits on its doorstep? Much has been made of the Melting Pot foundation bringing in disadvantaged young Bolivians to train up in the gastronomy business. Why, then, do I only see white faces cooking up my food through the plate glass window to the stainless steel kitchen – but distinctly local youngsters in all-black outfits doing the serving and saying very little? Questions abound from the strangeness of the Gustu experience. Surely Meyer is aware that Bolivian wine, while unknown in Europe and Northern America, is very gluggable? 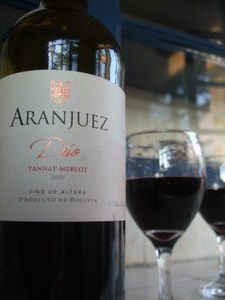 On a boozy night out to some very tacky nightclubs in Cochabamba, a city one day’s bus ride from La Paz, I bought too many bottles of Tarija Aranjuez red from the local cornershop at 25 Bolivianos each (£2.20) and enjoyed every slurp of what tasted like a leather-and-tobacco Bordeaux. (I almost bled through the eyes when three bottles of it, bought in duty-free at La Paz airport, were taken off me at Madrid airport.) Tourists with money will be making a pilgrimage south to the Tarija wine region and the vineywards on their organised tours, only just now opening up. Why is Gustu sneaking these wines out without making something of it for pig ignorant gringo punters like me? My dining partners seemed to be having out of body experiences sipping the rose we ordered, but the waiting staff didn’t attempt to explain to me the story or location of these wines. Yes, I need an English translation, as most of Gustu’s visitors will. If you’re asking people to pay for the Europe-in-Bolivia experience, and you want to educate and delight them, then help them out with staff who can answer questions in the international language of business about the produce on offer. It may sound pretentious, but that’s the reality of seeking out gastro-tourist dollars. Meyer isn’t maximising his golden opportunity to showcase Bolivia. Most of the reviews Gustu has had are glowing; the next big thing in gastronomy, another triumph for Noma’s founder, yadda yadda. These reviews are written by people who are not usually familiar with Bolivia, are sent on paid-for press trips with the quid pro quo of a positive review, and always appear to contain surprise that Bolivian food isn’t slop gathered by the hands of homeless children from open sewers. I think it’s clear that these reviewers go to Bolivia expecting bad food in a poor country, and come away relieved to find something that speaks to their Western sensibilities about experimentation and first-class surroundings, not to mention hygiene. It’s that safety factor again. Fair enough. But is that all there is? The offering is, to me, not enough – not exciting, adventurous, Bolivian enough, while the Eurocentric touches come across as bland. A couple of purple potatoes and some llama steak washed down with a Singani cocktail is not worth the air fare, nor the long taxi ride to the splendid isolation of Calacoto in an empty clown prison. Meyer has a large space into which he could easily invite Bolivia and become a Hadron Collider of local and global cultures. The vision needs a lot of engineering.